We have released two major changes. The first is our stylish new home page at IntenseDebate.com. Since you have to be logged out of your IntenseDebate account in order to see the front page (click here to logout), you might not have noticed that one. But, the next change you will undoubtedly notice when you’re logged into your account, and that’s your shiny new Edit Profile page. 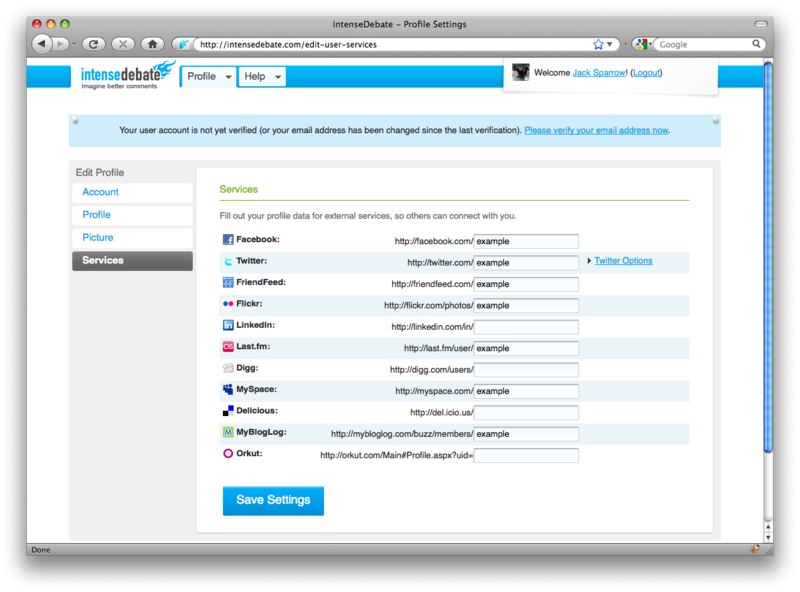 Account Page: here you can manage your basic account settings like your username, email address, OpenID, password, and email notification options. User Profile Page: your display name, profile description, and your personal websites (linked to in your profile) are all located here. 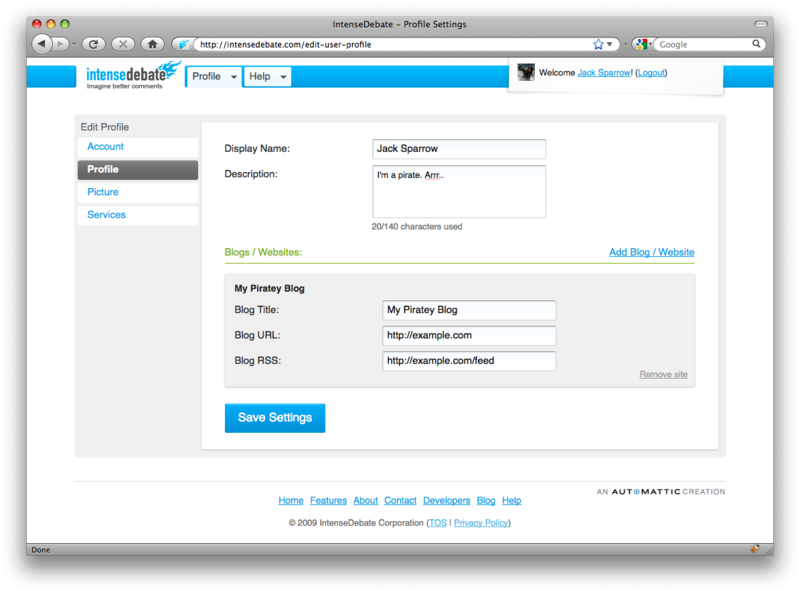 User Picture: manage your Gravatar or IntenseDebate avatar. Services: this is where you can manage all of your 3rd party services that you link to in your profile, as well as your Twitter account integration. The IntenseDebate Avatar Is Dead. Long Live The Gravatar! Big news! We’re migrating our avatar system over to Gravatar! We’re all part of the Automattic family and Gravatar has it down, so as the saying goes, “why recreate the wheel?” This is going to be a gradual process so don’t panic. A gravatar, or globally recognized avatar, is quite simply an image that follows you from site to site appearing beside your name when you do things. 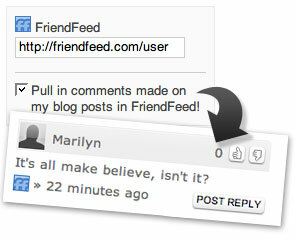 Avatars help identify your posts on blogs and web forums, so why not on any site? We’ve rolled out the first steps of this process. We now check to see if you have a gravatar and if you do, we’ll automatically use it. If you are using an IntenseDebate avatar instead of your gravatar then you’ll notice a change (unless your gravatar and IntenseDebate avatar are the same!). Our apologies for the inconvenience. Next up, you might have noticed the blue message in your IntenseDebate account prompting you to verify your email address. This is to make sure you are who you say you are. 😉 If you haven’t verified your email address yet, please go ahead and do so. We’ll keep you posted on the next phases of this project. If you haven’t discovered Gravatar yet, check it out and create your own! We’re like an assembly line. Our crew here is cranking out features with the efficiency of a well oiled machine. Props to Austin for cranking out his first feature release after only working at IntenseDebate for one week! I wasn’t kidding…he’s the LeBron James of developers. Thanks to Austin’s hard work, we’re able to release two more widely requested features. First up is Gravatar support – you asked for it, so you got it. Now you can use your Gravatar with IntenseDebate. 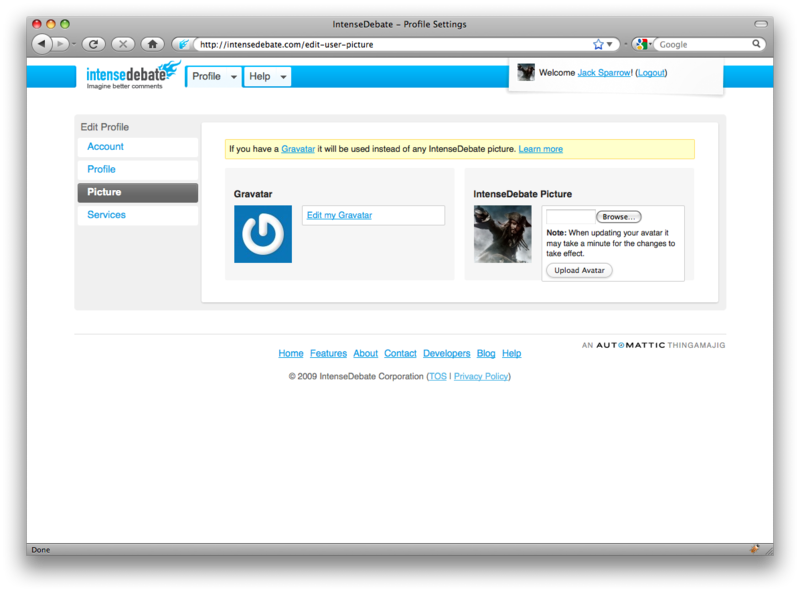 To use your Gravatar with IntenseDebate, check out the new option in your IntenseDebate profile (screenshot below). Don’t know what a Gravatar is? Learn more here. We’ve also released new moderation features for blog admins. 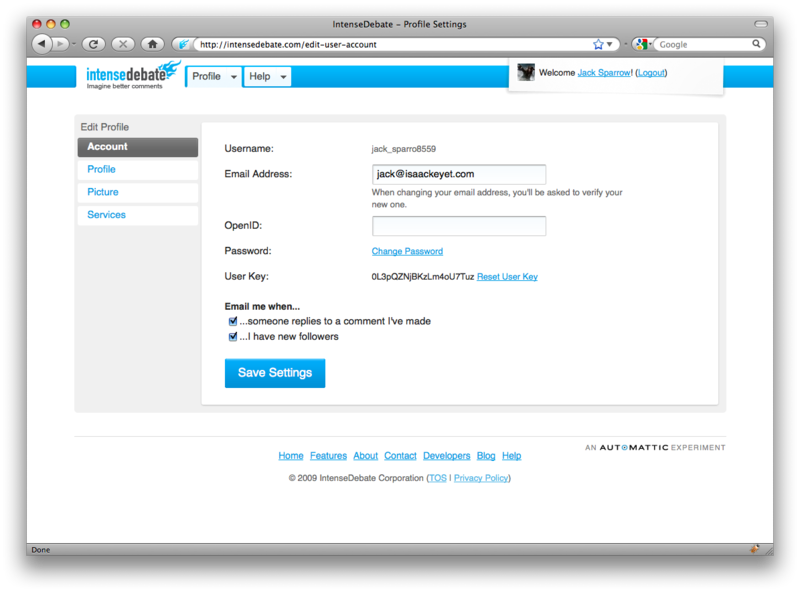 Admins are now able to ban a commenter from posting on their blog by IP address or email. This is useful for those pesky spammers and self-promoters that just won’t leave your blog alone. This gives admins the ability to ban anonymous commenters who haven’t created an IntenseDebate account as well. In addition, admins can also flag posts to be held for moderation based on IP and email. These new moderation tools are available in your “Settings” panel located in your IntenseDebate account. We love your feedback, so keep the ideas coming! Job well done Austin!